With the lazy days of summer over and my kids’ school year very much back in full swing, I am reacquainting myself with things such as getting breakfast ready at 7 am and packing lunches in a flash. I am also trying to use my slow cooker more because it truly makes dinner preparation a snap. My son plays football every day after school so by the time he gets home, waiting a while for me to make something just isn’t an option…he’s too hungry! I’m a hero if there’s something ready to eat in the crockpot when we walk in the door. I like being a hero. 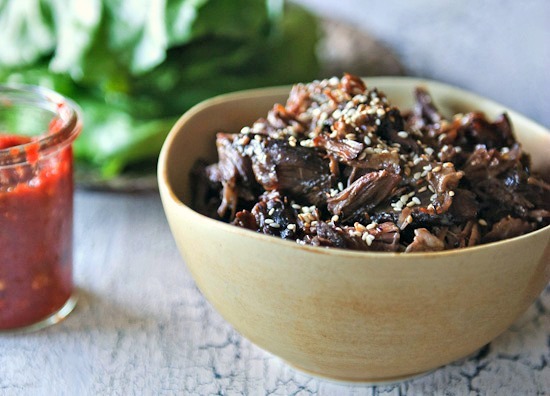 We love short ribs and they are really perfect for the crockpot. You want the meat to be fall-off-the-bone tender and that’s a certainly when you use a slow cooker to make them. 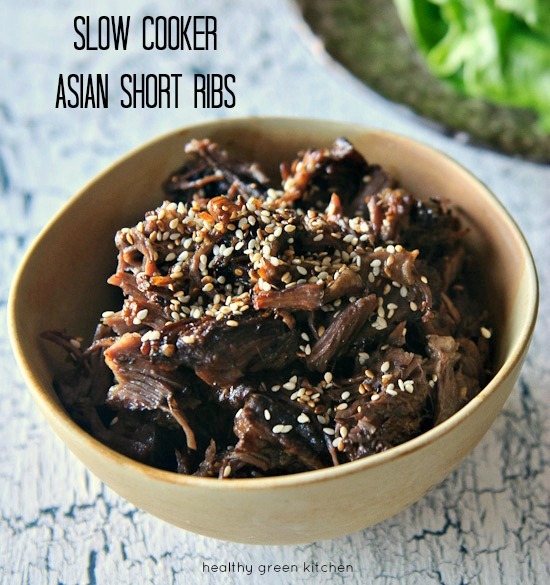 This recipe could not be simpler and makes quite a bit: I had enough of these slow cooker Asian short ribs left over to send with my son for lunch two days after we had this for dinner. Boston lettuce works well if you, too, want to make lettuce wraps with this recipe. If not, you can serve with rice and lots of veggies on the side. Kimchi makes a terrific accompaniment. Thanks to Smith Bites for the inspiration! 1. In a 4- to 6-quart slow cooker, combine the tamari or soy sauce, honey, vinegar, toasted sesame oil, garlic and chili pepper. Add the short ribs. 3. Remove short ribs from slow cooker and set aside to cool. Skim the fat from the cooking liquid and discard, then transfer the liquid to a pot on the stove. Bring to a boil, then reduce heat to a simmer and cook until the liquid has reduced and thickened, about 15 minutes. 4. Pull meat off the rib bones with your fingers or with a fork and place into a bowl. Add the reduced liquid to taste (if there is a lot left over, you can serve the rest of the sauce on the side). Transfer meat to a serving dish or bowl and garnish with the toasted sesame seeds. Winnie, I love nothing then slow braising short ribs during the winter. I do not have a slow cooker so I do it in the oven all day … tender, moist and flavorful. Cannot wait to try your recipe, I like the idea of wrapping them in lettuce leaves with rice and cilantro. What a fantastically delicious recipe. I love anything made in a slow cooker, and this looks especially superb. These look so good! How long should they cook on low? Your recipe inspires me to break out my slow-cooker which is gathering dust. Thanks! So excited it’s slow cooker season again!!! Yum! I love to use my slow cooker all year long, but I’ve definitely been pulling it out a bit more often the last few weeks. I can’t wait to try this recipe… I bought some short ribs at the farmers market with no inspiration for them. This was just what I was looking for! Delicious but I needed to add some liquid at the start or the braising liquid tended to want to caramelize before it worked its magic. A big winner for dinner with rice! Yes, I guess it all depends on how much fat is on the short ribs. I am glad you modified the recipe a little to make it work, and glad you enjoyed it! I’m going to try this but what do I do with the sesame oil and do I need to brown the meat before I put in crock pot ?? Oops! The sesame oil gets mixed with the other ingredients that you put in the crockpot with the short ribs. Nope, I did not brown the meat first. Hope that helps!